The subject of the production of renewable energy is becoming increasingly important not only in Europe, but also throughout the world. Renewable technologies like solar and wind energy are becoming more practical. The production of electricity via eco-friendly systems is constantly increasing. Therefore electric underfloor and ceiling heating becomes more and more relevant. Calorique’s iQFlexHeat radiant heating easily combines with renewable energy sources (for example with a PV roof system). Even without Photovoltaic the underfloor heating or ceiling heating with Calorique pays for itself, because it consumes very little energy. 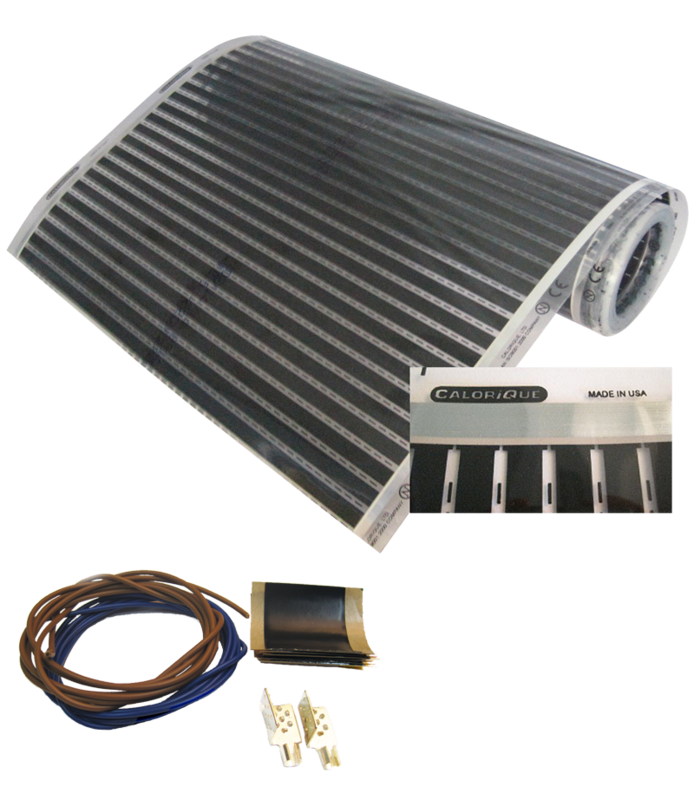 The heating film converts more than 99% of the energy into comfortable warmness without identifiable losses. In relation to other forms of heating, the low acquisition and operating costs are particularly advantageous. This makes electric floor or ceiling heating with iQFlexHeat a worthwhile investment for the present and the future. IQFlexHeat is a patented carbon heating element , which differs substantially from water and cable systems. It allows a simple installation of the electrical underfloor heating, ceiling, wall and surface heating all over or parts of an apartment. It is compatible with almost all building materials and floor coverings such as laminate, parquet, wood, carpet or tile. Comfort – The electric underfloor heating, ceiling or wall heating with Calorique provides a uniform distribution of warmth. Feel comfortable! Drafts are minimized and the temperature remains at a lower level. The sensed temperature is higher than the actual one. Efficiency – Surface heating with Calorique foil consumes only the energy needed for the ideal temperature thanks to a precise control and adapts to the energy demand. Reliability – The heat foil is long lasting – about 30 years. The parallel circuit of the individual strips or active elements ensures operability of the electric underfloor heating or ceiling heating, even if individual elements should fail due to mechanical damage. Health – Radiant underfloor heating same as ceiling heating produces no swirls of dust. This type of heater is therefore particularly suitable for allergy and asthma sufferers. Maintenance free – Calorique iQFlexHeat foil installed as surface heating, i.e. electric underfloor heating or ceiling heating is maintenance free. Easy installation – The iQFlexheat foil can be combined with every flooring and building material. It does not take up any space. The thickness of the film is only 0.3 mm, making it ideal for renovations / refurbishments and alterations in buildings. Environmentally friendly – The production of Calorique foil is environmentally friendly. The heat foil contains no environmentally harmful components. It is perfectly suitable for recycling. All our products comply with RoHS directives. No EMF – The heat film does not generate electro-magnetic fields. As an option, we offer a full scale screening of the active surface. Safety - The carrier film is not flammable.